Access Your Bonus Downloads from the Book HERE! 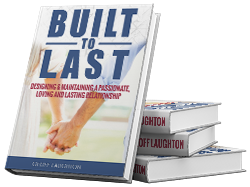 Geoff Laughton shares the secret to a long-lasting relationship in his new book Built to Last: Designing & Maintaining A Passionate, Loving, and Lasting Relationship. Haven't picked up your copy yet? As an additional "Thank you" for purchasing the book, I have provided several hours of bonus gifts that take concepts from different chapters in the book to an even deeper but practical level.